Welcome to Pacific Watersports web page! We will be expanding our web presence, so check back often for specials! We offer Scuba Diving Courses from PADI ranging from beginner to professional levels and snorkeling courses as well. As a PADI Scuba Diving and Snorkeling Center you will always get quality training, service, equipment and dive safety is always ensured during all of our scuba diving/snorkeling sessions. An award-winning, multi-faceted scuba diving/snorkeling center! 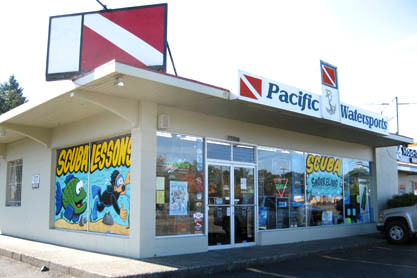 Pacific Watersports of Aloha, Oregon offers training, service, air fills, rental equipment and a full line of equipment for Northwest and Tropical Scuba Diving and Snorkeling (we have kids snorkeling gear). We have a friendly, knowledgeable staff - all with the intention of providing our customers with the most complete and enjoyable diving/snorkeling experience possible. Now, you need only one address to access all of the SCUBA/Snorkeling-related needs. We are dedicated to help divers/snorkelers of all levels and abilities find what they need to make their chosen sport safe and enjoyable. Quality Classes - We offer a full line of PADI Courses from Experience programs, eLearning to Professional Level Certification. Learn More.. Diving Adventures - Diving doesn't end with certification, we continually schedule dives to keep you active. Check out some of our Adventures or Continuing Education Dives. Advice - We are properly trained to give you the right advice, our answers are not driven by sales! We are driven by Happy Returning Customers. Find out more about The Local Advantage. Our Shop has a fully stocked retail showroom. Check our up-to-date Calendar for upcoming Classes, Adventures, Events, and Specials. ATTENTION Open Water Diver eLearners: If you plan to continue your training with Pacific Watersports eLearning Crew-Pak is included in cost.